Higgins replaced an old, redundant heating system with a newer, more functional, and longer lasting solution. Project: Installation of a college’s new heating system. Services supplied: Removing the old system and installing new and safer suspended radiator panels. Improving the quality of the heating system was the number one priority. The college required a new system that would modernise their outdated installation, with a focus on student safety. The college needed a professional with CHAS and Gas Safe accreditation. Challenge: Installing a new heating system while working towards a limited time frame. 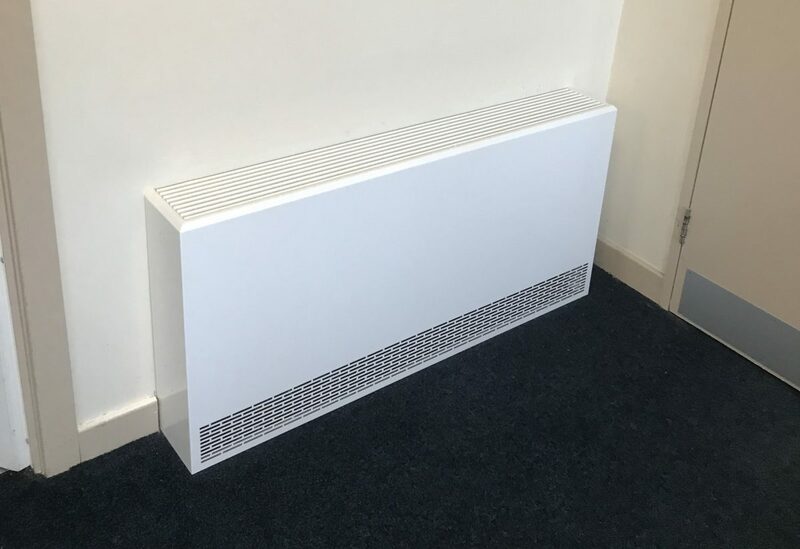 Improving the quality of the heating required stripping out the old central heating distributions, convector blow heaters, and traditional steel panel radiators and replacing them with a modern, more efficient system. Building a system to last: We removed a redundant system and replaced it with an up-to-date, efficient installation to extend the life of the system. This would allow for greater functionality and prevent any future costly repairs. A key part of Higgins’ solution was to strip out the traditional, steel radiators and replace them with Low Surface Temperature (LST) radiators and suspended radiator panels within a false ceiling that we installed. Suspended radiator panels free up wall space, which is essential in a school environment, not to mention the fact they look great! Making safety a priority: Older systems can cause safety concerns, especially in the education environment. A new system allowed us to install LST radiators. These are safer due to the way they cool the surface of the radiator without decreasing the heat output. Our CHAS accreditation and Gas Safe Engineer status also made us a top pick for the college. Installation: The installation of the new system required us to get the job done within a six-week time frame. It required stripping out the traditional system, including convector blow heaters and traditional steel panel radiators. Lasting quality: We sourced the right materials to ensure that the new heating system remains efficient, cost-effective, and safe for years to come. Project management: Communicating with the college, the Higgins team, and material sources was essential to making sure we completed the job in the correct time frame and to budget. Throughout the process, we ensured the client was kept up-to-date regarding progress. A modern, functioning, high-quality heating system. We removed the heating system and radiators, and replaced them within the allocated time frame and budget and installed while following the correct regulations. With years of experience delivering projects just like this one, Higgins is well placed to solve any of your specialist gas installation needs. Get in touch with us today on 01625 613 308 see what we can do for you.